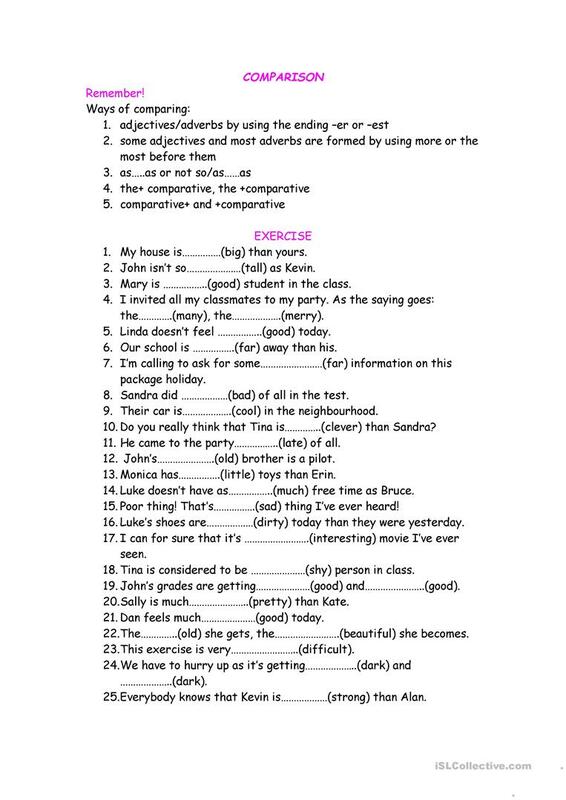 This worksheet is contains a reminder on the ways of comparing as well as an exercise to practise. It is mostly suitable for intermediate students as it has includes some difficult forms as well, like the+comparative, the+ comparative etc. This downloadable teaching material is a great resource for business/professional students, high school students, elementary school students and adults at Pre-intermediate (A2), Intermediate (B1), Upper-intermediate (B2), Advanced (C1) and Proficient (C2) level. It is aimed at teaching Adjectives, Comparison (comparative and superlative), Comparison: Comparative adjectives and structures, Comparison: Superlative adjectives and structures and Comparisons: AS or THAN in English, and can be used for enhancing your pupils' Spelling skills. It features the vocabulary topic of Actions.